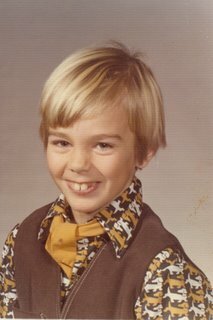 But I think that I had better fashion sense. His school didn't require a uniform that year and now, he has to live with that for the rest of his life. 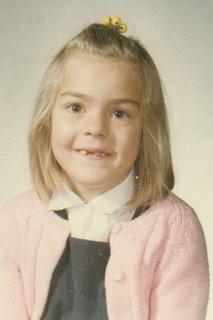 I had a more sensible school and we wore tunics and jackets for most of the year. When I got older, they let us wear other clothing for photo day. When I look back and see the great misfortune that is 1970s fashion (yes, I'm that old), I appreciate my navy tunic and white tights. See my pink sweater? My beloved Aunt Mary bought that for me and even though I was not a 'pink' girl, I loved that sweater. Mary isn't as cool as my Aunt Vivian but she always made me feel special. Vivian is my hero. I'll tell you about her one day.